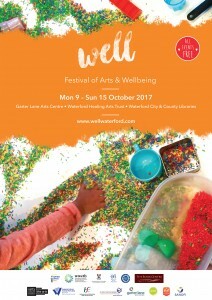 Well Festival of Arts and Wellbeing 2017 takes place Monday 9 to Sunday 15 October, throughout Waterford City and County, and features an exciting line-up of 36 fun, inventive and sociable arts events for all ages, all entirely free. This year’s festival presents musicians, artists, filmmakers and storytellers from home and abroad and, to celebrate its fifth birthday, a new programme of free events for children entitled “Wellies”. Well Festival is funded by the Arts Council, Waterford City and County Council and Sanofi, and is presented by Waterford Healing Arts Trust, Garter Lane Arts Centre and Waterford City and County Libraries. Further details from www.wellwaterford.com and follow the Well Festival on Facebook, Twitter and Instagram and Vimeo. The Well festival champions the links between arts and wellbeing and celebrates the health benefits of participation in the arts by everyone. Each day of this year’s festival, Waterford people will have the opportunity to witness colourful, beautiful, thought-provoking music, art, film and literature and to experience the joy of creativity through dance sessions, art and photography workshops and growing for wellbeing. Events take place at University Hospital Waterford, Garter Lane Arts Centre and Studios, and Waterford Libraries, including Central Library, Tramore Library, Kilmacthomas and Carrickphierish, as well as The Book Centre and the Waterford Greenway. Highlights of the Well Festival of Arts and Wellbeing 2017 programme include The Creative Check Up, a light-hearted “mobile hospital” where participants can have their artistic health checked and go home with a prescription for a daily dose of arts experiences; Dance for Parkinson’s, a gentle movement class for people with Parkinson’s and carers; daily lunchtime live music sessions in the foyer of University Hospital Waterford (UHW); a book club social with award-winning writer Claire Keegan; stunning visual art and photographic exhibitions by Darragh Lyons, Sinéad McDonald, Debbie Godsell, Keith Currams and a group of asylum seekers living in direct provision in Waterford; Night Flowers, a night-time installation of flower lanterns in the grounds of UHW; a workshop for musicians working in healthcare; and the ever-popular festival flagship event We haven’t had an earthquake lately, with guest MC, WLR’s Mary O’Neill. For children, the newly titled “Wellies” programme includes storytelling, art workshops, movies at Garter Lane Arts Centre and live music in the Paediatric Ward at UHW. Debbie Johnston, from Waterford City and County Libraries, said “We are really pleased to be able to present events around the county of Waterford as well. We’re delighted to team up with Mayfield Birds of Prey for a nature trail along the Waterford Greenway, and to bring the renowned writer Claire Keegan to Tramore Library for our Book Club Social”. Caroline Senior, Artistic Director of Garter Lane Arts Centre, added “We are very grateful to our funders the Arts Council and Waterford City and County Council, and our major sponsor Sanofi, whose support not only allows us to present Well each year, but this year enables us to offer all our events for free for the first time. So we invite people of all ages, from all walks of life to join us for Well 2017 and experience firsthand how good it feels to get involved in the arts”.